An all in one device that integrates with security systems and smart home devices, plus the docking station becomes a Wi-Fi hotspot. 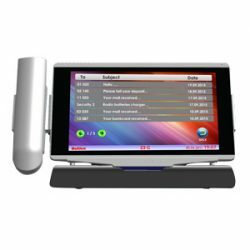 All the features of the VIP-70 STD 7″Display, an all in one device that integrates with Intercom, security and smart home systems. This hand held device enables you to walk around and make & answer calls, call neighbours, guards, reception and control all of your smart home system devices. The tablet is charged via standard dock or mini USB charging cable. Please Note: Alarm and smart home features are the same as standard VIP70-Alarm and VIP70 – Smart devices.